Buckhead Betty ... on a Budget: Party Dresses! I LOVE a good dress. The reappearance of the 50's Housewife dress (a la Mad Men) has made me so happy - the big circle skirts, shirt dresses, and modest necklines make me swoon. When Target had Isaac Mizrahi on staff, I took advantage of it and bought a few of his dresses. Since he left Target (tear), Merona has stepped up their game and took his place. Paired with some stilettos and pearls, these dresses are perfect for work, a summery wedding, and church. There are some very cute new ones on display from Merona right now in the stores, and then they also have great ones online too. 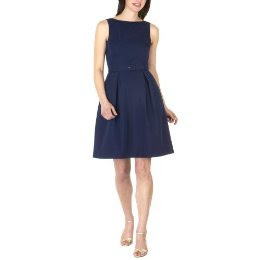 This girly flared-out navy blue dress could be perfect for a wedding shower, or toned down for work with a sweater. The purple one with the beaded neckline would work the room at any cocktail party.